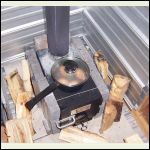 I finally got around setting up a wood stove in my small cabin - it is ready for our visits during colder months. 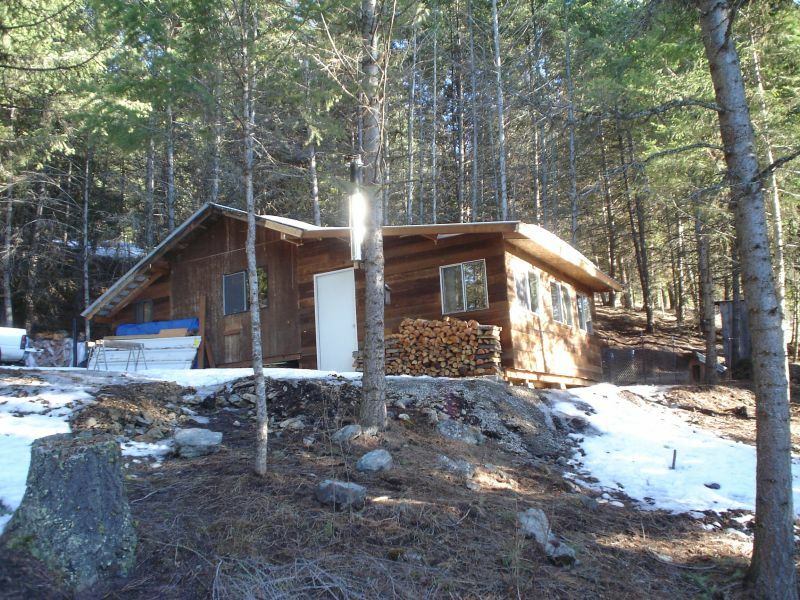 My problem was that I have a very limited space inside the cabin, and with basic minimum clearing requriements of 18" between the wood stove and combustible surfaces I would have to isntall wood stove pretty much in the middle of the cabin... far from the wall and everything else. 5). Metal sheet and ceramic tile for the floor protection. 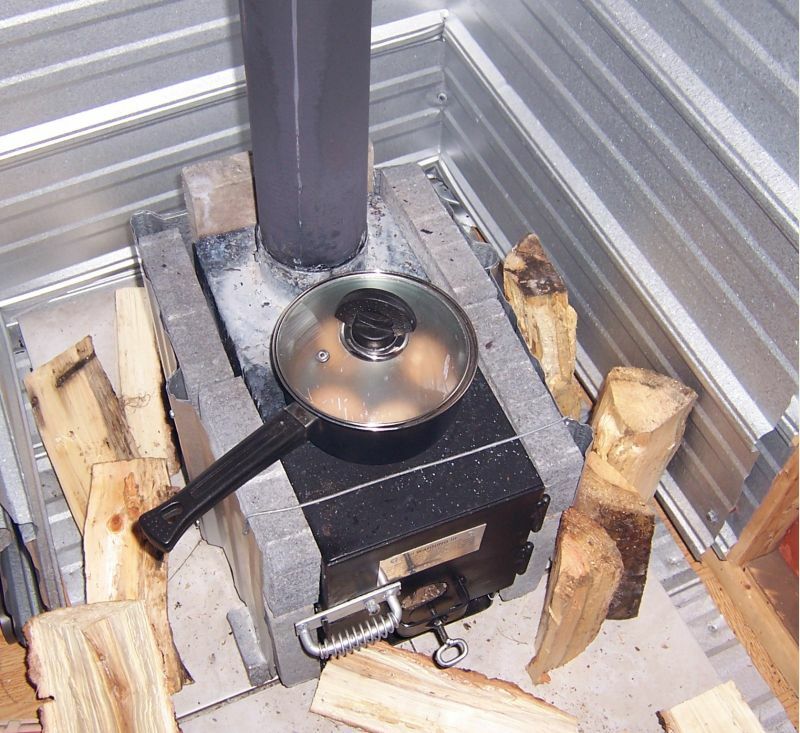 Perhaps my small cabin wood stove setup is not to the last letter of the building code, but I know it is safe � during my test burn the cabin wall surface behind the dual layer of heat shield was not even warm to the touch. For the chimney, I used a larger diameter stove pipe as a heat shield and cut a hole in the ceiling with additional clearance, then sealed connections with high-temperature wood stove cement. On the roof, I installed a rain cap with a metal spark arrestor (also prevents animals from getting in through the chimney). I have also installed a carbon monoxide detector inside the cabin. I love the idea of the two layers of sheet metal. The spacers could be made from any metal - I used peaces of copper pipe because I had some available. I don't think there will be a galvanic reaction unless moisture is also present, and the stove will help keep that corner dry. Using the decorative ceiling panels is a great idea. They are a bit pricey so it might be worthwhile matching the standoffs and fasteners just to be safe. Or use the tin-coated panels, which are corrosion resistant. we are going to face the same problems as far a space . what brand of stove did you use , and how big is it ? Looks good. Should retain some heat. Here's a chart that might help those questioning safety of their set up. 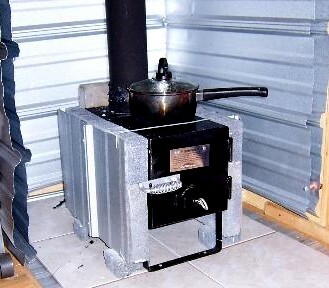 I used this wood stove. It's smallest I could find (my cabin is only ~100 sq.ft). how hard was it to find the 4" stove pipe or did the same place sell it ? i did,t see the pipe on the site . that will be plenty of heat for a little cabin . ours is only 120 sq/ft . the price is rite . how hard was it to find the 4" stove pipe or did the same place sell it ? I got the "kit" from the same supplier - it included > 4 ft of 4" pipe, dampener and rain cup. I couldn't find the 4" wood stove piple locally, so I ordered extra pipe together with the stove. If your looking for a low priced woodstove, check out the link below. This is cast iron, not sheet metal and uses a 6 inch flue. I bought this one on sale from Lowes for only $79, but ended up returning it for the shielded one I mentioned above. there is no 4 " stove pipe around here either it would have to be ordered at the same time . For a thimble, or a through the wall insulated double-wall chimney section, I was told by a woodstove dealer to simply use a smaller section of stovepipe insulated with "ceramic strand" insulation, then set it inside a larger stovepipe. He said it would'nt meet code, but was essentially the same thing as the commercial thimbles he quoted me $175 for. I bought enough ceramic strand insulation from a refractory company to do two thimbles for $15. I have yet to install my woodstove, so I don't yet know how well this will work. i got my new stove this week. i make some mods . i added a little tray to the front to catch sparks , i made the damper airtight . and i am gonna line it with fire brick . i think its going to work good will let you know . i have to do the though the wall thing aswell . i think i will just leave an air gap , two flanges with a pipe that the stove pipe just fits into and no insulation . That essentially what I just described, except with the addition of the ceramic strand insulation. It is, as mentioned, very inexpensive, although may not be very easy to access. If I understand correctly, most of the code requirements regarding chimney installation is designed to prevent or delay combustion in the event of a chimney fire, not, as I first thought, to prevent combustion during normal use. 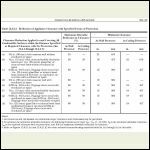 If you do give insulation any further consideration, I understand a "welding blanket" is basically thye same thing, and may be easily obtained from a welding supply shop. Good luck on your installation. So, I gave this small wood stove a good try over this New Year Eve - it worked quite well, as I expected. I am trying to find a small wood stove that obtains its combustian air through an outside the cabin inlet vent. Some oil and gas stoves use this outside air source. My concern is that I don't want to bring in cold outside air just to feed the wood stove. 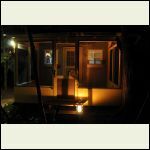 I have a well insulated, 160 square foot cabin. Is this a valid concern, or is it unnecessary? I should have given some details on my "Cabin". It is actually a shipping container, that was just delivered, during a snow storm, last Friday afternoon. I slept in it on Friday night and it got down to 0 degrees F. My water froze so I even had trouble making a pot of coffee. I am located at 5000 feet in Central Nevada. I am on 5 acres, with a well. Typical of this elevation, in this area, means sage brush, and no trees within miles. I plan to insulate the inside with a combination of fiberglass and polystyrene foam sheets. I plan to build 2 partitions, one about 4 feet from the large heavy doors, and another about 20 feet back from that one. These partitions will have regular doors, with a window next to the front door. The living quarters will be the front area, and storage in the rear. I have not decided about heating, either an oil heater or a wood stove. The oil heater that I was considering is made for small cabins or tents, and takes outside air in through a duct and exhausts normally through a chiminey. This container is virtually air tight, I plan to make a few air intake vents, maybe even add a 12 volt computer fan to assist the air movement, one direction of the other. So far those are the plans. Any suggestions would be greatly appreciated. - Taking air from the outside could be considered more safe. Good luck with your project, hermit89049. Perhaps post some pictures of your 'Cabin'. I am still doing research on wood stoves and would like some more advice. 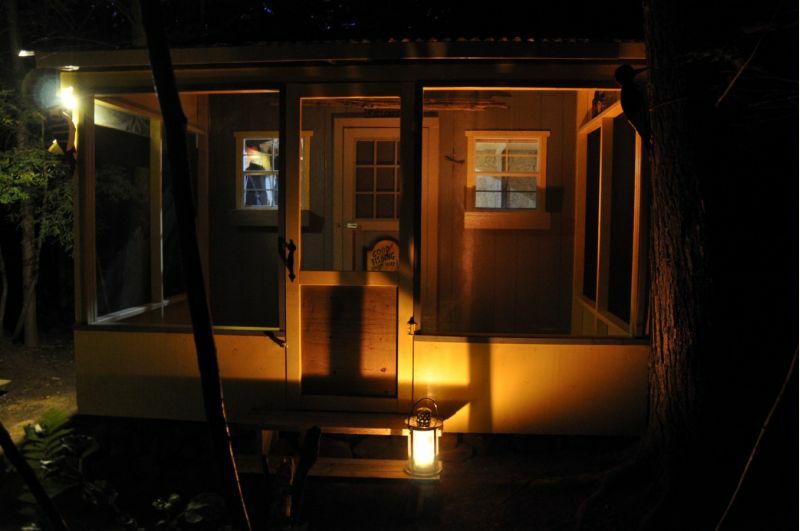 We have a 12x8 cabin with a newly added 12x7 screened-in porch. I'm wondering if we should install a small wood stove in the cabin where we would be spending a few fall nights OR install a slightly bigger one on the porch and leave the cabin door open so as to let in the heat. The cabin is not insulated... yet. I'm curious about this because most cheap and small stoves are meant for outdoor tent use and I fear that putting one into the cabin would risk safety. It would also leave space in the already tiny cabin. Also, our porch has a clear, corrugated plastic roof and I assume I would have to cut some of it out and replace with metal roof so as not to burn the plastic when we put in the chimney pipe. And finally, I wonder if we have to make the chimney pipe go straight up through the roof or if we can have it come out one of the side walls and then go straight up. This would really make things a lot easier as we would hate to cut through our existing roofs. My basement wood stove at home has its pipe like that. Direct venting is prferable to a through the wall installation for a couple reasons. A better draw will result with a straght line run than one which has bends, and more of the chimney will be exposed to the cold in a through the wall installation, causing more creosote build-up and further inhibiting draw. Through the wall is acceptable, but not the preferred method. There is a difference between stovepipe and chimney pipe, and through the wall installations use a "thimble" to pass safely through the wall. Although it wont meet code, I posted sometime earlier on this site about making one using ceramic strand insulation wrapped around a length of stovepipe. 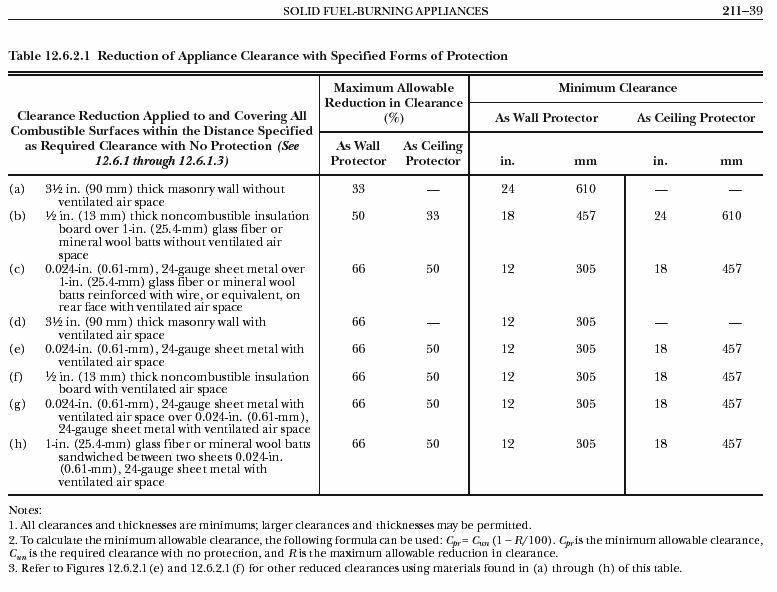 The air space between metal and brick is a good trick for reducing clearances. Want to increase heat production paint that metal black and leave a 3 inch gap at floor for an air intake. As cool air rises behind metal panel and is heated it will travel into the room on thermal current. Same principle used in solar air heaters that I build. Cabinbuilder, I like what you have done with your stove set up. I would like to imitate this project. I have some questions for you. How long did this project take to complete? Does your cabin get very smoky? Is the stove airtight? How much clearance did you give between the hole in the roof and the edge of the pipe? 2"? And what did you use to fill the gap with? If you could do it over again what would you change? Would you buy a different stove? I found an airtight, swing top, cylinder-shaped stove at Le Baron but fear it would be difficult to insulate with bricks because of the shape. So I will keep looking. If anyone has any more tips please let me know. Thanks all. I took me couple of days, but I wasn't in a hurry. I used a high-temperature wood stove cement (from the Home Depot / wood stove section) to seal all chimney fittings, although it doesn't seem to work that well - it cracks and parts of it fell off after first burn; but it's better than nothing. It is not that air tight, but I do not get smoke problem - the upward draft is quite strong. My chimney pipe is 4" diameter, with another one 6" peace at the ceiling acting as a heat shield. I was aiming for the gap from that shield to the roof plywood ~ 4" but it worked out less because a roof joist was near (I covered portion of that joist with a tin sheet for the additional heat protection). So, if possible, place stove between roof joists. 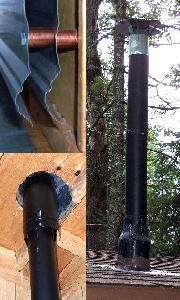 I used a tin sheet (peace of duct pipe) to cover the space between chimney and roof plywood, then sealed it all using a black silicon sealant / fire rated caulk, also from Home Depot / wood stove section. I didn't want to spend a lot of money for my cabin heating project, but for what is worth - it works for me quite well. Thanks for your advice CabinBuilder. The search for a good wood stove for a tiny space has been very tiring so far and I have not found anything that I like and is affordable. I have seen the Jotul 620 wood stove and think it is the best so far, but at $1300 it is way beyond my spending limit. Will have to keep looking or eventually go with a wall tent heater. Safety is the biggest concern with every step. Give a shout if you want to talk SMALL stoves. I've got a small 14 x 10 foot cabin in which I use a Jotul 602 to good effect. Mine didn't cost $1300, though with the chimney it came to nearly that. I think the stove itself was about $600. There are apparently over a million of these in existence, so I'd think you could find a used one. You can build a simple non combustible wall very simply with 1/4 inch hardi backer cement board. you can use pvc pipe as a spacer as it will take a ton of heat without melting or catching fire. you need one inch air cap and most important has to be open on the bottom and top of the sheet. Nice set up by the way. 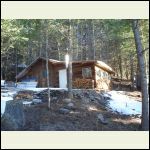 I just went to your site Mark and found a lot of the same things that I went through and am going through in remodeling an exsisting cabin.